I got this press release from the Talladega Superspeedway. TALLADEGA, Ala. – Much like the opening weekend of deer season holds a special place in the minds of hunters, so does the second weekend in February hold a special place in the minds of wild game cooks. This year the third annual Chevrolet/Alabama Wildlife Federation (AWF) Wild Game Cook-Off at Talladega Superspeedway is set for Saturday, Feb. 9 in the track’s NASCAR Sprint Cup Series garage. The event will be open to the public from 3 p.m. to 6:30 p.m., and will feature taste testing of savory wild game recipes, unique auction items combining the worlds of outdoors and motorsports, great door prizes and more! Visitors are encouraged to arrive early in order to check out all of the creative displays and sample all of the delicious wild game dishes offered by the teams set up throughout the garage. The center aisle of the garage will again feature an array of spectacular and unique silent auction items, attractively displayed for browsing as guests sample the delicious food. Cook-off judging is set for 3:30 p.m. and winners will be announced at 6:00 p.m. Teams are allowed to enter one dish in one of the following categories: fish, fowl or game. First, second and third place awards will be presented in each category. A Best Overall Award will be presented to the entry with the highest score, which automatically qualifies that team to enter the State Finals competition at the AWF headquarters in Millbrook, AL at a later date. Tickets to attend the Chevrolet AWF Wild Game Cook-Off are $40 per person, or $50 per couple when purchased prior to the event. To purchase tickets, pre-order rides around the track or participate as a cook team call Alabama Wildlife Federation at 1-800-822-9453 or visit their website at www.alabamawildlife.org. All proceeds from the event will benefit AWF, the oldest and largest non-profit conservation organization in Alabama. The AWF was established by sportsmen in 1935 to promote the conservation and wise use of our wildlife and natural resources and to ensure a high quality of life for future generations of Alabamians. The organization holds wild game cook-offs throughout the state, however this statewide event is its largest fundraiser each year. Weekend, featuring the Aaron’s 312 NASCAR Nationwide Series and Aaron’s 499 NASCAR Sprint Cup Series races, set for April 25-27. Friday, April 25 will feature NASCAR Sprint Cup Series practice and The Birmingham News Qualifying for the NASCAR Nationwide Series. Saturday, April 26 will feature The Birmingham News Qualifying for the NASCAR Sprint Cup Series and the Aaron’s 312 NASCAR Nationwide Series race. Then on Sunday, April 27, the greatest drivers in the world will compete in the Aaron’s 499 NASCAR Sprint Cup Series race. Kids age 11 and younger are admitted free of charge to the general admission grandstands when accompanied by a ticketed adult on Friday and Saturday. Tickets are available by calling 1-877-Go2-DEGA, (1-877-462-3342). For our hearing impaired guests, please call TDD 1-866-ISC-TRAK (1-866-472-8725). Tickets also are available online at www.racetickets.com, or in person by visiting the Talladega Superspeedway Ticket Office from 8 a.m. - 4 p.m. CDT, Monday- Friday. The first is about the meat industry, which applies to some of the things I learned vegan week. I have a friend who is vegetarian because of the strain he feels Americans put on the environment. "Global demand for meat has multiplied in recent years, encouraged by growing affluence and nourished by the proliferation of huge, confined animal feeding operations. These assembly-line meat factories consume enormous amounts of energy, pollute water supplies, generate significant greenhouse gases and require ever-increasing amounts of corn, soy and other grains, a dependency that has led to the destruction of vast swaths of the world’s tropical rain forests." "Professor Dawson told me that he had expected to find little or no microbial transfer from mouth to chip to dip, which would support George’s nonchalance. The results surprised him." Do not miss Wednesday's Your Table: in addition to some fun stories on cooking and new cook books, we've got 12 recipes to satisfy everything from your sweet tooth to your Super Bowl party. Book reviews include the current British invasion of cookbooks and a collection of recipes that are made well in advance. It's been interesting to hear the new advertising campaign for Tabasco hot sauce. I love the stuff, so the commercials definitely have caught my attention. While driving to work the last few days, several times I've heard the new radio spots that urge sports fans to use Tabasco red on their pizza for Sunday's Super Bowl. I'm crazy for this stuff, so that doesn't seem weird to me. I use it on just about everything, in one form or another. But I'm glad to see the the Tabasco folks reaching out to non-traditional hot-sauce people and trying to get them to use it (sparingly, of course) on foods that aren't normally hot-sauce material. Hot sauce on pizza? Try a little, just a dab. It's good. I used my smoke this weekend. The ribs fell a little flat. I was so afraid of over seasoning, I didn't put enough of the spice rub on the meat. It was super tender, nice and smoky but it just didn't have the kick I was looking for. OK, so 12 brave souls lined up at the Burns Supper buffet and came away with their haggis, neeps and tatties. The neeps and tatties went fast; basically they were potatoes and rutabagas diced and roasted slow with butter, parsley, salt, pepper and some onions. I'd make them again. The haggis needs some 'splaining. A former intern sent us a can of haggis from Scotland. The Brits I've emailed recommended a shepherd's pie: the haggis mixed with diced turnips, carrots and a diced potato, topped with mashed potatoes and baked until bubbly and hot. The verdict: surprisingly positive, considering that these folks knew they were eating lamb offal disguised as a shepherd's pie. True, the mashed potatoes and copious amounts of butter probably masked the haggis so much that a true Scot wouldn't have recognized it. And we pulled out some Tabasco. But, all in all, "not bad" seemed to be the general consensus. Every now and then, it's a good idea to turn the kitchen over to the younger set. They like to get in there and mess around, and as long as no one gets burned or severs an artery, we're good. Last night was declared kid chef night... proclaimed by the kid chefs. The menu: grilled cheese sandwiches with chicken noodle soup (from a can but dressed up with fresh herbs of the chef's choice) and quesadillas with, of all things, broccoli and cheese soup. The quesadillas were good (see recipe in What's Cooking Tonight), but weren't quite the right mix with the soup. All in all, however, it was a fun effort. The kitchen wasn't trashed, everyone got enough to eat (especially the dog who snagged a piece of cheese after it fell from the slicer at an odd angle). Highly recommended. The great Scottish poet Robert Burns is honored today. At The Star, we find ourselves in possession of a can of gin-u-wine Scottish haggis sent by a former intern who is now in St. Andrews. I emailed some folks on the BBC's food message board, and they had some recommendations for making a shepherd's pie from the haggis. Done, with two sticks of butter in the mashed potatoes. I also roasted some potatoes and rutabagas (neeps and tatties, in Scots terms) to go with them. This won't be a meal for the faint of heart, and we've apparently got a lot of faint hearts up here at the paper. So, it's been confirmed. My children, who pretty much eat anything a normal child won't touch, truly stepped into the abyss of weird last night. The day before, we'd gone to the produce stand, and they'd picked out some items. Cauliflower was among their choices, and it's always been a favorite. They prepped it -- trimmed the florets and put them in a pot to steam -- then went to play in their rooms. Meanwhile, I'm thinking, 'Hey, I'll give them a treat and make a sauce.' Usually, there's time only to steam and slap on some butter, but, heck, we were way ahead of schedule, so I splurged on a silky smooth sauce with just a whisper of nutmeg. The kids approach their plates. They pause. A few minutes later, they're picking at a vegetable they usually scarf down. I inquire. "What's up?" The 8-year-old offers this bit of diplomacy: "Mom, well -- you did a good job, it's good -- but I can't taste the cauliflower. All I'm getting is cheese." Another pause. "Cheddar." Another pause. "I'm totally losing the cauliflower." Curse that ratatouille movie and that stupid rat with his discriminating palate. Back when I was working 50 miles from home, I went out for lunch nearly every day. A cute little restaurant opened by a young lady that was a wonderful cook. She'd create these wonderful pasta dishes, salads and sandwiches that would make your mouth water just thinking about them. This is a recipe that you will turn to over and over because it's that good! About halfway through cooking, I start cutting the chicken breasts into smaller chunks to use in a salad. A spatula will cut the tender chicken just fine. Let the chicken get golden brown, but not over-cooked, place pieces on paper towels. While the chicken is cooking you can prepare your favorite items together for a tossed salad, or cook pasta or rice to serve the chicken with. Try this recipe and let me know what you think. This morning has been a rough one. An 11:00pm bedtime makes any morning rough when the kiddies go to bed at 8:00pm and Mommy at 9:00pm. So, what do a rough morning and a late bedtime have to do with food? Well, all that means tonight's dinner has to be quick and easy. When I started discussing what I thought I would have with my fellow food cohorts, I found out that quite a few people feel the way I do when you mention salmon patties. Everybody loves salmon patties! 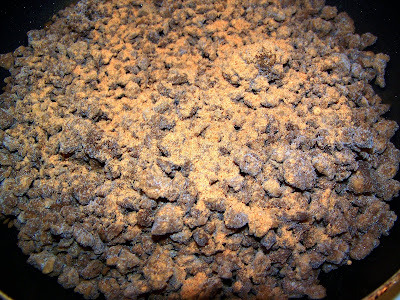 Mix all ingredients together except for the cornmeal and oil. Form patties with mixture, coat with corn meal or additional bread crumbs and fry to golden brown. Being that this will be a quick dinner, the rice will be Minute Rice and the biscuits will come out of a can. Apple & Eve has expanded its Sesame Street line of juice boxes with the launch of new Sesame Street Organics 100% Fruit Juice Boxes. Sesame Street Organics 100 percent Fruit Juice Boxes, which are fortified with calcium and contain a full day’s supply of Vitamin C, are available in three flavors: Big Bird’s Apple, Elmo’s Punch and Ernie’s Berry. The Organic line showcases each of the three Sesame Street characters dressed as a farmer – highlighting the “fresh from the organic farm” spirit of the new products. In addition, Sesame Street Organics is packaged in 4-ounce juice boxes – the recommended beverage size for kids ages 2 to 5. Last night on Emeril live, his head shopper came back with a king's ransom of meat. One of his dishes used three kinds of sausage, cabbage, sauerkraut and apples in a huge paella pan. It looked great, came together fast. Any meal that uses three kinds of sausage must be good. He had genuine bratwurst (he's in New York), chorizo, kielbasa... Good stuff. Today in The Star's food section, we've got a combination of man, meat and beer. A triumverate of testosterone. Staff Writer Brett Buckner caught up with some guys whose cooking skills extend well beyond a grill and open flame. In Pitcher This, our beer guy on tap Ben Cunningham talks about the right Mardi Gras-inspired beer, and then there's a guide to picking and choosing the perfect roast. The Editor's Recipe Pick of the Week: Prudence Hilburn has a quick, simple Jambalaya that's so simple, a sea urchin could put it together. At the grocery store, when the check out clerk asks, "paper or plastic?," what's the more ecologically sound choice? Consider this: About 14 million trees are used annually to make paper bags for Americans. And, it takes 12 million barrels of oil to make a year's worth of plastic bag. The National Co-op Grocers Association, which represents 109 natural food co-ops across the nation suggests the choice should be: "Neither." "For the environmentally conscious, deciding whether to use paper or plastic at a grocery store can make you feel like you're caught between a paper mill and a petrochemical plant," said Robynn Shrader, chief executive officer for NCGA. "If at all possible, this environmental dilemma has a fairly easy solution: BYOB, 'bring your own bag.'" Shrader suggests making a small investment in reusable bags and keeping them in one's home, car and/or office. Seek bags that are sturdy (heavy canvas is one good choice) and roomy enough to haul groceries (string cotton bags expand greatly but can also be easily tucked into a purse or backpack). Another option is bringing one's own storage crates, which make loading and unloading groceries especially easy. We've got a guy here at the office that does the crate/box thing, and, man, do people look at him funny. 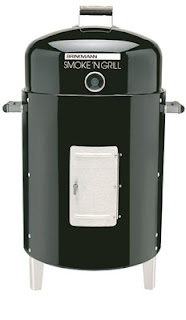 For my birthday (on the 27th) my wife got me a charcoal smoker. This Brinkmann is not a huge high dollar deal ($29.99 at Wal-Mart), but it comes highly recommended from a friend who had one in college. 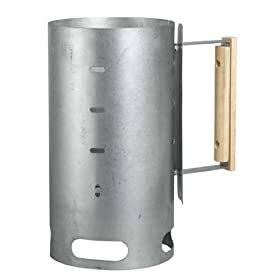 I also wanted a more portable grill and this unit can also be used as a small charcoal grill if you rearrange the insides. I'm planning to jump in with some Memphis dry rub ribs this weekend. I grilled ribs back about a month ago, now I'll smoke the baby backs and see the difference. Last time I used a rub recipe from Steve Raichlen's BBQ USA, but it was a little to spicy. It had chili powder and paprika as the main ingredients. Any better dry rub recipes that are good out there? I've seen some that include brown sugar. For the smoker I bought some hickory chunks for this venture, but I have read that fruit woods (apple, pecan, etc.) can add flavor. Does anyone have a good, cheap source for apple or pecan wood in the Anniston/Helfin/Wedowee area? Free reusable shopping bags given out today in Mountain Brook store. Organic and natural market giant, Whole Foods Market, will end the use of disposable plastic grocery bags at the checkouts in all of its 270 stores in the U.S., Canada and the U.K. with the goal to be plastic bag-free by Earth Day, April 22. Officials hope the BYOB(ag) movement makes a lasting impact. The first U.S. supermarket to commit to completely eliminating disposable plastic bags , Whole Foods Market has declared today “Bring Your Own Bag Day” and will give out over 50,000 reusable shopping bags to customers at the checkouts this morning to celebrate today’s announcement. “We hope to inspire shoppers to prompt positive environmental change by adopting the reusable bag mindset,” added Gallo. A series of photographs came our way the other day. They illustrated what families around the world spent on food each week. The amounts ranged from $500 to $2. That got me thinking about what we spend on food each week here in Alabama. If you lined up a week's worth of your food on the table and counters, what would the rest of the world see? There are some signature dishes that almost every household has -- at least with the kids. With my mom, it was her ham-and-egg casserole (extremely popular after Easter.) With us, it seems to be a country-fried steak and gravy that will make an 8-year-old boy abandon a football game, come inside and set the table for dinner. Even the 5-year-old with the appetite of a gnat can polish off a good helping of it. That's good eats, right there. And it doesn't get any simpler. The key is to get nice, thin-cut slices of round steak. They cook quick, brown nicely. Season them with a little black pepper, garlic powder, Season All and a pinch (barely) of cayenne. Dredge them in flour (seasoned quite liberally with Season All) and lightly fry in, what else? bacon grease. The gravy comes together by adding a tablespoon or two of the dredging flour immediately after cooking to the skillet (cast iron) and concocting a milk-based, pepper-laced elixir from heaven. To go with: black-eyed peas seasoned with sage and onion, green beans (more bacon) and a hunk o' cornbread the size of a Volkswagen. Actual review from said 8-year-old after eating his second slice, but still sopping up gravy with the cornbread: "Mom, Emeril couldn't make something this good." While cake may be the glamourous dessert, pie is generally the universal favorite. A cake is pretty much a one-trick pony, but pie is so versatile, it's a whole zoo of possibilities. APC's call to action is an effort to have pie lovers "pay it forward" by spreading goodwill through sharing pie with loved ones and strangers alike." The great tradition of pie has a way of invoking childhood memories of warm feelings and the closeness of sharing with others that makes everyone feel good," said Linda Hoskins, APC's executive director. "Why not pass that special feeling onto others? Get two pies when you're at the grocery store - one to enjoy with your family and one to give to the person behind you in line. Bring a pie to a new neighbor and get to know each other over a slice of pie. You might indulge your co-workers and bring some pie to work, or you can say 'thank you' to someone with a warm hug wrapped in a delicious crust." Mmm. As over the top as Ms. Hoskins's effusions are, Pie Day is good. 1/2 cup peanut butter, 1/2 cup water, 3 eggs, 3lemons, and a half teaspoon of salt. Heat and whisk and use as salad dressing? Some 75 years ago, this was a trendy, hot new recipe featured in The Star. Also prime back then? Cream of Peanut Butter soup. That's cooking along with children, not actually using the tykes as an ingredient. One of our favorite things to do is plan the night before what we might want for dinner in the next day or two. This turns into a fun game at the grocery of "you picked it, you gotta eat it." It can quickly turn into the equivalent of kitchen-chicken, however, as one sibling tries to outdo the other. It's almost like watching two mini producers see what they'll tempt Andrew Zimmern with on an episode of Bizarre Foods. I'm headed out later today to see if any of the hot new cookbooks have made it into our areas. My collection, purged annually, hovers around 70, but I'm always looking for new stuff. Just to be honest, my transition back to meat-eating didn't turn out like I had planned. I had been telling everyone that my first non-vegan meal would be a Papa John's meat-lovers pizza. But it wasn't. It was cereal. Actually, it was vegan-friendly cereal with real milk — not exactly the end-of-vegan-week celebration I was hoping for, but it was still good. And how much weight did I lose? I would tell you, but I lost my scale. Seriously. It took a 900-page report, but the Food and Drug Administration says meat and dairy products from cloned food is as safe as that from non-cloned (we'll call them "normal") animals. Details on the ruling go on to explain that it would be the offspring from cloned animals that would be marketed, not necessarily the first-generation of clones. The irony: In 1997, Scottish scientists produced the sheep Dolly, the first cloned animal. Sheep aren't on the FDA's approved list. The results are in. I lost six pounds over vegan week. I started off at 224 in jeans and shoes last Saturday and was 218 on this Friday. I also had a tofu burrito from Moe's Southwest Grill in Douglasville, Ga. Friday. I asked the guys behind the counter if the beans were vegan and they checked the recipe and said the pintos were cooked in water, salt and "Southwest Seasoning." It was my first time eating tofu and I was really surprised that it was not bad. It was a lot like eating the white part of a boiled egg. The 100 finalists have been chosen for the 43rd annual Pillsbury Bake-off. No Alabama cooks made it to the finals, which will be in Dallas this year. I suppose that's not surprising, considering that no one from Alabama has ever won the prize, according to the list of winners Pillsbury supplied. Indeed, looking over the list of past winners, there have been only 7 winners from The South. (A handful of folks from Florida have won, but I think that's basically a northern state that happens to be warm, so I don't count it.) Most winners are from California (not surpsing, given the population, I guess) and the Midwest. That Midwestern success makes me say, Huh? Having grown up on the dividing line between the Midwest and the South, this predilection for Midwestern baking has me thrown. I grew up eating Midwestern food, but my culinary personality, such that it is, matured under a Southern seasoning. I can say unequivocally: No way, no how is the food better in Bemidji, Minn., than it is down here. Perhaps the reason for this disparity is that the true Southern baker makes his or her own stuff and doesn't rely on the refrigerated section so much? In tomorrow's Star, the 2008 flavor forecast is headed for Your Table. This year the blends are spicy, a little exotic, but easy to apply for the home kitchen. Lots of citrus and fresh flavors from around the globe are the hot trends. Balancing that globe-trotting spice report is Prudence Hilburn's Gourmet Touch, which looks at the versatile and simple potato. The cold weather this week makes it prime time for soups and stews, and we've got some classics. The North Carolina SweetPotato Commission is sponsoring its first national recipe contest for non-professional cooks. The Get Fresh with North Carolina Sweet Potatoes Recipe Contest kicked off last September with a new Web site designated especially for this competition, click here for details. The contest runs through April 15. The Commission has received over 200 recipes since September. There are four recipe categories: soups, salads, sides and sweets (desserts). A winner from each of the categories will receive $500 for his/her recipe. The grand prizewinner will be selected from the four category winners and will receive a cash prize of $3,000 making a total prize package of $5,000. The contest is open to U.S. residents who are not professional cooks. Last night, Food Network showed an unsung hero in Midwest-Border State cuisine, if there is such a thing: The Hot Brown. Trust me, this is the best turkey dish you will EVER put in your mouth. On the show "Throwdown," Bobby Flay went to The Bluegrass State to Louisville (prounounced LOOL-vull) to watch the Castro brothers (Joe and John) cook up a classic Hot Brown. Flay says this open-faced turkey sandwich is the top seller on his lunch menu at Cafe Americain in New York City, so he wanted to pit it against the top Hot Brown in its native element. Melt butter and add enough flour to make a reasonably thick roux (enough to absorb all of the butter). Add milk and Parmesan cheese. Add egg to thicken sauce, but do not allow sauce to boil. Remove from heat. Add salt and pepper to taste. For each Hot Brown, place two slices of toast on a metal (or flameproof) dish. Cover the toast with a liberal amount of turkey. Pour a generous amount of sauce over the turkey and toast. Sprinkle with additional Parmesan cheese. Place entire dish under a broiler until the sauce is speckled brown and bubbly. Remove from broiler, cross two pieces of bacon on top, and serve immediately. Papa John's has announced that the pizza chain will start a text ordering system in time for the NFL playoffs. The e-commerce measure by the country's third-largest pizza brand will work by customers sending a text to a general number, and the order going out to the area restaurants. Sunday lunch will never be the same. I may have missed an episode of Iron Chef (Food Network), but has Michael Symon been on yet as a competitor? The only time I remember seeing him on was when he and John Besh were battling it out for the title of "The Next Iron Chef." I loved Symon during the series that led to his selection, and I was hoping he'd be picked more. For some reason, Bobby Flay and Mario Batali are almost always chosen. Rarely do you see Cat Cora or Morimoto. Iron Chef is a regular viewing option in our house. My boy loves Bobby Flay, and I think Mario Batali is too cool. The show is a great way to see intense kitchen skills, and, believe it or not, you can actually get some interesting ideas from it. Earlier this week, I got tired of reading the labels on everything. OK, I was tired of reading labels before this week even officially started. I had hoped to get through the week using the cosmetics and toiletries I already had at home, but that didn't work out like I had planned. With three girls living in my house, I was able to find a vegan-friendly brand of almost everything I needed. For the few things I couldn't find, I decided to take the easy way out and pay a visit to Friends Natural Market in Oxford. Many of the items at Friends are labeled "no animal products" and "animal-cruelty free". Some products even carry a "V" logo for vegan-friendly. I bought lotion, conditioner and a bar of soap. As far as I can tell, the vegan products work just as well as what I normally use, they just cost a little bit more. An 18-ounce bottle of lotion cost me $9.49. That's considerably more than I usually spend, but it was worth it — no more reading labels. Finding vegan-friendly products at Wal-Mart and other stores is possible, if you know what you're looking for. I would start with these lists of companies that do and don't conduct animal testing. Here's something I've never been accused of before. I tried to kiss my wife right after she had eaten some cheddar flavored Sun Chips (not vegan) and she accused me of only kissing here because I was trying to taste cheese. Haha. This brings up a good point (sort of brings it up). I think I could date/marry a vegetarian, but I'm not sure I could date/marry a vegan. The entire lifestyle is different. Would someone who had vegan convictions about animals marry someone who didn't? I'm sure it has happened plenty of times, but what is that like? A gluten free diet is required by those with Celiac Disease and other conditions where foods containing gluten are not tolerated. Gluten is a protein found in all types of wheat, rye and barley. The soups come in 10-ounce portions and can be ordered here . I admit it. I broke a rule — but i didn't mean to. Yesterday, I wore a leather necklace. I didn't even think about it until I got home last night. Breakfast this morning was amazing. I made pancakes with Bisquick and rice milk. Then I covered the pancakes with fresh strawberries, real maple syrup and a little bit of powdered sugar. I would eat that again even if I wasn't going vegan. I also tried a recipe from Vegan Cupcakes Take Over the World. (You can read the author's blog here.) My cookies and cream cupcakes looked great and smelled great and they tasted pretty good too — at least I thought they did. The cupcakes were easy to make and didn't call for any special ingredients other than rice milk. The scone mixes (there are seven) make enough for a dozen scones. The mix is basically the organic flour, leavening and any seasoning; customers add butter, eggs and liquid for a product that's mostly homemade. Super easy instructions, minimal packaging. Great taste. We made the Raspberry White Chocolate scones. Other selections: Lemon Poppy Seed, Chocolate Hazlenut, Blueberry Ginger, along with the more conventional cream, oatmeal and apricot-cranberry. The jam (eight varieties) we reviewed was raspberry. Beautiful red color, lovely flavor and very fresh. Maybe it was the organic berries, but this was good stuff. Others: Meyer lemon, strawberry rhubarb and a blood orange-cranberry. We didn't get any of the pepper jellies, but they look intriguing: Roasted Garlic Black Olive, Wasabi Lime, Vidalia Onion, to name a few. lollipoptree is a family-owned speciality food manufacturer in Portsmouth, N.H.
Well... it IS made at home. You'll want a pan of cornbread to go with this. Brown about a pound of ground chuck. Drain any fat that may be there after it's cooked. Add the meat to the soup mixture, bring to a boil, then simmer for a few hours. If you like a thicker soup, add instant potato flakes while it is boiling. This also adds extra flavor. Be sure the cornbread comes from an iron skillet. Whoo-hoo! So far, the closest I've come to falling off the vegan-wagon is staring at the hunk of cornbread hiding under the piece of aluminum foil on my kitchen counter. I'm a simple Southern girl at heart, and there are few things I enjoy more than a bowl of warm cornbread and "sweet milk." But tonight, that all changed. I was sitting at my desk, listening to my stomach growl and trying to decide what I could have for supper, when I smelled something delicious. I recognized the scent immediately, but I had to make sure. My nose led me straight to the source. A certain Star sports editor and Star sports copy editor were thoroughly enjoying dinner at their desks — Arby's roast beef sandwiches. If they hadn't eaten all but the last few curly fries, I probably would have asked for a bite. This morning, while I was getting ready for work, I listened to the soundtrack from the movie Walk the Line. I figured it was an appropriate choice since Joaquin Phoenix, who plays Johnny Cash in the movie, is a vegan and animal-rights activist. Want to know who else is going vegan? Click here. 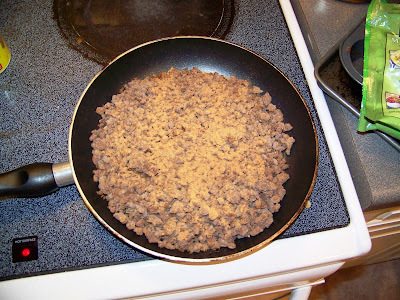 Pictures of my Morning Star Farms Meal Starter pseudo-ground beef. I made burritos (the orange powder on top is taco seasoning). Wrapped in a tortilla with salsa and black beans, it wasn't a bad dinner, but I didn't go for seconds. It is made of Textured vegetable protien (SOY PROTEIN CONCENTRATE, WHEAT GLUTEN, WATER FOR HYDRATION). Here is a link to a site about vegan baseball gloves. Tonight I'll be playing basketball with the guys from work like we do, nearly every week. I'll have to talk to them about using a rubber ball instead of the composite leather ball we've been playing with. I'll do a video tonight to tell you how it goes. Wednesday's Your Table focuses on something that could best (and most stereotypically) be referred to as Man Food. We've got some basic, hearty recipes, a review (by a guy) of Rachael Ray's new cookbook. Top that off with a freshly drawn serving of Pitcher This, the Star's beer column by Ben Cunningham. This week, he looks at why your craft beer price is about to go up. I just had an apple that was almost too juicy to eat without leaving a puddle of water on my desk. It was a Gala, one of the best type to just grab and munch. Outstanding flavor, which reminds us that apples are great in the fall and winter, and they're particularly good this year. One of the best ways to enjoy fresh apples is to make that childhood favorite: applesauce. The flavor is totally different from what you get from a jar. Fabulous with pork chops, wonderful on oatmeal or spread on a muffin, this is versatile hot or cold. 1/8 teaspoon each cinnamon and allspice. Maybe toss in a pinch of cloves, if you're bored. Put in a food processor (or a blender, with just a little water or apple juice to get it moistened), then whirl away until it reaches the consistency you want. Adjust seasonings as you please. Oh, our vegan friends can use this, too. It really is possible to order vegan food at a restaurant. P.F. Chang's China Bistro in Birmingham has several vegetarian entrees, many of which are vegan-friendly. I ordered vegetable chow fun. It's a dish made with rice noodles and slivered vegetables. I had some questions about an ingredient they call "vegetarian mushroom oyster sauce," but their online menu says it's not made with any animal products. I ate half of the food and saved the rest for tomorrow. For local vegan-friendly fare, I recommend the hummus dip at Mellow Mushroom. It's just an appetizer, but I've ordered it as a meal several times. In fact, I had it for dinner last night. Today, I decided I can't eat peanut butter and jelly sandwiches the rest of the week while everyone around me is enjoying chicken fingers, Philly cheese steak sandwiches and freshly-baked pound cake. So, I went through the pantry and refrigerator. .. and a few of the things I can't. Some of it was obvious (there really are eggs in egg noodles), but some of it surprised me. For example, bread crumbs contain egg and milk products and Cheetos are made with real cheese. I also discovered Bisquick is vegan-friendly if you can find a recipe that doesn't call for milk or eggs. I may have to experiment with some soy or rice milk later in the week. But for now, I'm leaving for Birmingham. Know any vegan-friendly restaurants? Cook the onion in the margarine for about 5 minutes. Add the corn and the hash browns. Add about 1 1/2 cups of the broth, then add the soy milk, salt and dill. Bring to a simmer. Blend the flour and the remaining broth (at room temperature) to make a thin mixture. Stir into the simmering, just bubbling soup; stir well. Soup will begin to thicken, but stir it to keep any clumps from forming. Reduce heat to low and add the peppers; cover with a lid. Let cook another 10 minutes or so. Serve with the egg-free, milk-free bread/cracker product of your vegan choice. One thing the Internet age has done is increase the vareity of goods available to home cooks. Where once only restaurants could order really cool stuff, there are now online stores that will shop small amounts to your door. One of the broadest, most affordable lines out there is from Kikkoman, and especially the company's Asian Authentics line. As is often the case with bottled sauces, there's a lot of sodium in there, so lighten up on the salt. But the wasabi paste, panko bread crumbs, and line of miso could come in handy for some Asian-inspired dinners. In a large, heavy saucepan, stir the onions and oil together. Cook slowly (about 15 minutes) over medium heat until the onions are softa nd slightly browned. Add everything except the bread and cheese. Stir and heat; cover and simmer about 10 minutes. To serve, heat the oven's broiler. Add soup to 6 oven-safe bowls. Add 1 slice of bread on top of the soup; top with a slice of cheese. Immediately put under the broiler and broil until the cheese starts to brown and bubble. BE CAREFUL not to burn the cheese. I found this site when I was trying to see if I could eat Pop-Tarts this morning. I didn't think I could eat the conveniently little pseudo-pastries because they contain "cracker meal." Turns out, cracker meal is simply flour and water. The Web site lists a ton of products that are supposed to be vegan. Breakfast just got a little easier. And by the way, I did remember to leave my favorite leather-bound Bible at home. Instead, I used one of the pew Bibles to follow along during the sermon. For the rest of this week, I will be reading the Bible on the Internet. So I thought breakfast was going to be the easiest meal of the day for vegan week. Not so fast my friend. My normal breakfast foods (Eggos, frozen biscuits, pancakes, cheese grits, muffin mix, Special K bars) all have eggs or whey or milk or something that keeps me from eating them this week. The only breakfast food in our kitchen I can eat is frozen hash browns. I had thought the breakfast was easiest because I don't usually eat any obvious animal products like bacon or sausage and I can easily substitute orange juice for milk. It's not as easy as I thought. Now one of my last hopes will be Pop Tarts. Surely they are unnatural enough to leave the animals alone. Oh and as far as my last meals go, I didn't do so hot. I was hoping for porkchops with a side of chicken and ribs, but instead my wonderful wife and I were out shopping and picked up Zaxby's for lunch and Taco Bell for dinner. Not quite last supper material. Somehow, Laura and Andy convinced me to join in on Vegan Week ... but that was before I knew what I was getting into. When they asked me, I thought it would be difficult, but not impossible. I don't eat hamburgers. I don't drink milk. I don't eat eggs. I do eat chicken, and lots of it. But what's the point of going vegan for a week if you don't have to give up something? Then they told me I couldn't wear anything that was made with animal products and I couldn't use anything that had been tested on animals. That left me sitting in my bathroom floor for about an hour last night, laptop in hand, reading labels and researching companies to determine how much money I would have to spend to make this experiment a success. 1. Mary Kay and Merle Norman are my new best friends. Both companies have policies against animal testing and, so far, I haven't found any obvious animal-derived ingredients in any of their products. Maybelline and Revlon also have several vegan-friendly options. 3. Vegans should learn to live without chapstick. I was trying to decipher the tiny print on my 9th tube of chapstick when I finally found a brand that did not contain beeswax or lanolin — Mary Kay's Lip Protector Sunscreen. It's not technically a chapstick, but it will have to work. 4. Cheap shoes are good shoes. After going through every shoe in my closet, I found four pairs of vegan-friendly shoes — three of which are sandals or flip-flops. The most expensive pair of shoes I will be wearing this week cost me less than $20. Vegan Week officially begins tonight at midnight. I'll be posting updates daily to let you know if I'm surviving. I believe I have been invited to join this blog for two reasons. 2) I am going vegan for a week for a story and Laura wants you to enjoy my misery. Anyway that starts on Sunday, so I'll be sure to keep you updated on how that goes. I'll be going through my closet tonight making sure I have shoes (no leather) and clothes (no wool, no silk) that I can wear next week. The sharp, spiral snare at the end of Pigtail’s tapered, stainless steel shaft is cleverly designed to lightly pierce the edge of virtually any solid food. A quick flip of the wrist and the food is turned over. Pigtail can handle almost anything from an 8 lb.rack of ribs, to hot dogs, steaks, chicken, bacon, French toast, shrimp, vegetables, you name it! The 19 inch Pigtail is great for outdoor cooking, but it is equally at home in the kitchen oven or broiler. Everything I have ever read about grilling says that poking holes in the meat is not a good thing. Is there something different about "lightly piercing" the meat? I'll let you know how it turns out on some pork chops this weekend (my last supper before being vegan). In the meantime what are the rules about piercing the meat? Is there a difference between hooking the meat and poking all the way through? 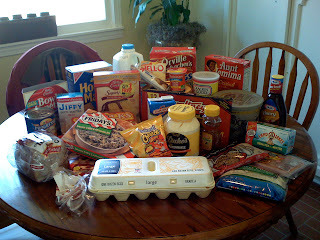 The last month or so of 2007 was something of a food rut in our house. There wasn't a lot new coming onto the table, and my regular recipes, which used to be greeted with enthusiasm by the two freakishly adventurous young eaters in our home, were met with bland acceptance. The little ones have been gone for a week. That's given me plenty of time to explore some new recipe ideas and make plans to introduce at least one totally new dish once a week. It's an effort to stir the pot, I suppose. The spousal unit meets this with skepticism and says it will probably last right up until the first swing of baseball season. We'll see. One of my favorite TV chefs -- Jamie Oliver -- is coming back to Food Network, although I suppose they're not hoping to reach many working people by having him on at 8:30 in the morning. Typically I'm a huge proponent of fresh (or even quality frozen) over canned. The lone exception: tomatoes out of season. A good canned tomato beats a Styrofoam, strip-mined tomato anytime. There's always an arsenal of canned tomato varieties in my pantry, from whole to sliced to diced. They're versatile. They also take me back to the days when I was a kid and we canned hundreds of quarts of tomatoes every summer. The taste isn't quite the same, but the convenience sure is. Put your water on to boil for the pasta, following the directions on the back of the package. Add about 2 teaspoons of salt to the water. In a small bowl, add the garlic, red pepper, Italian seasoning, oil and a pinch of salt. Microwave about 20 seconds -- just enough to heat the oil and let the seasonings begin to flavor it. Take out about 1 tablespoon of the oil/herbs and put it in a skillet over medium heat. Add mushrooms to the oil and saute until the mushrooms are tender, but not mushy. When the mushrooms begin to release water, turn the heat down as low as it will go. They'll continue to cook, as well as making their own sauce as they release water into the skillet. By now, your pasta water should be boiling. Add pasta. It'll take about 10 minutes to cook at a gentle boil. When it's done, drain it well in a colander. DO NOT RINSE IT. Return pasta to the hot pan that it just came from. Add the mushrooms and their liquid, the remaining olive oil/herbs and about 2 tablespoons of Paremesan cheese. Mix well. Taste one of the tortellini to see if it needs more salt or pepper. OK, it's not really that hot. But it is quite possibly one of my favorite things about food -- hot sauces of all types and when (and how much) you should use them. Hot sauces are like wines and beers; everyone has a favorite, and you can't convince anyone that they're wrong. There are times when I think the best is the cheap, 50-cent sauce that you see on the tables of Cajun joints -- just plain hot sauce that has a good taste, not too much, not too little. I also have my preference for sauces to use in Bloody Marys, for instance. It's not the same sauce that I want on my oysters. Tabasco's Web site isn't bad. It's pretty good, in fact. 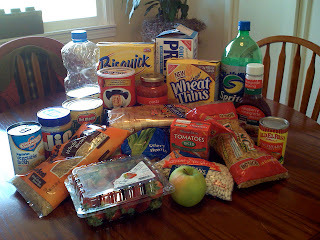 It has links to all of its products, with recipes and all sorts of things to try. Check it out. My advice: If a hot sauce labels itself as being "hotter than ... ", don't buy it. It's going too much for the heat and too little for the taste. The best sauces are the ones that have enough heat to burn if you overuse, but also have a wonderful taste when you use in moderation. In post-holiday housekeeping and sorting, Michael Pollan's In Defense of Food came across my desk and will be featured in an upcoming Your Table. Pollan's latest book appears to be a rallying cry to food lovers everywhere. Much of what we eat today isn't really food at all, Pollan says, but rather junk trumped up to pass as food. Far from being a food snob, Pollan is more of a food realist. Know what you eat, and don't eat garbage. So far, his voice has been the most consistent, on the national stage, to beat this drum.